Mermaid style.Off the shoulder.Beaded.Floor length.Zipper closure. -If you are unsatisfied,please exchange or return it within 30 days after receiving it,and products should be the original condtion even after tried on for fit and size. CUSTOM:We can custom make dress for you in any size and color,just please contact your WEAR DATE and accurate measurements(BUST-WAIST-HIPS,HEIGHT,HOLLOW TO FLOOR,HEIGHT,SHOES HEEL HEIGHT),ABOUT HOW TO MEASURE,please kindly refer to our pictures.Thank you. -Tailoring usually takes 5-7 days,by expeited shipping,it usually takes 2-3 days;by standard shipping,it usually takes 7-10 days. -If you need it urgently,please leave an message to tell YOUR WEAR DATE and CHOOSE EXPEITED SHIIPPING and we will provide rush service. -If you have any other questions or after-sale issues,please feel free to contact us firstly,we will give you a great solution!Thank you! Fabric:Lace.2018 Lace Beading Mermaid Prom Dress Long Off the Shoulder V-neck Evening Party Gowns for Women Formal. 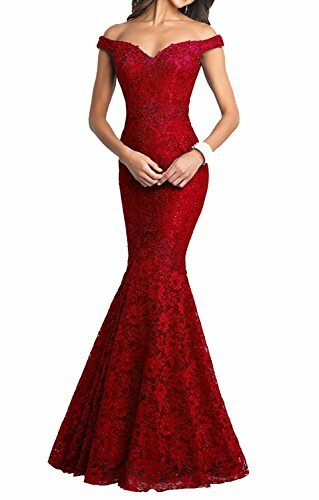 Mermaid style.Off the shoulder.Lace Beading.Floor length.Zipper closure.Suit for prom/evening//wedding/bridesmaid/party/ball and other special occasions. TO FIT ON YOU WELL,BUST-WAIST-HIPS ARE VERY IMPORTANT FOR THIS BODYCON MERMAID DRESS.Please kindly refer to OUR SIZE CHART on the left and choose the right size for yourself.If you have any doubts about your Size or Color, please contact us freely! Custom:We can custom any size and colors.If you need this service,Please tell YOUR WEAR DATE and your correct measurements about BUST-WAIST-HIPS,HEIGHT FROM HEAD TO TOE(Without Heels),SHOES HEEL HEIGHT. If you need it urgently,please choose EXPEITED SHIPPING and tell your WEAR DATE we will provide rush service!For more dreamy and affordable dress, please click in our shop "Lily Wedding" above the Title.